PHARR — While a bill passed by state legislators in the 2017 session allowing school districts to relinquish control of struggling campuses to charter schools is making waves elsewhere, PSJA ISD officials are considering how the benefits of adopting such a bill would uniquely service local schools. Senate Bill 1882 opens the door for school districts to give up the operation of campuses through contracts with open-enrollment charter schools, or with an entity that is granted charter status if approved by the state commissioner of education. Such a partnership would in turn grant the school districts two extra years to turnaround schools that are on the brink of being sanctioned due to poor performance, as well as additional funding if their current finances are less than that of charter schools. But it is not necessary for a campus to be struggling in order for the district to create such partnerships and benefit. Celeste Goodwin asks a question to PSJA ISD Superintendent Daniel King about the voting process for campuses to opt in to a charter-style funding initiative at Yzaguirre Middle School Thursday, May 10, 2018, in San Juan. This is where PSJA school district Superintendent Daniel King saw potential to do what he said he has been thinking about since the 1990s — a way to merge the benefits of a public school district that services the entire community with some of the flexibility and additional funding of charter schools. This would allow more innovation within each campus. King began looking into the bill and its options in November 2017, he said, and for the last two months he worked with administrators to further develop a proposal that requires to first be presented and later approved first by teachers, then by the board of trustees and finally by the Texas Education Agency prior to implementation. The superintendent dubbed this model, “Empowered ED, An Innovative Model for Governance, Leadership and Resource Allocation,” and if approved by these tiers the district would receive about $909 more in state funding per student annually. This could amount to $28 million total per year if all campuses participate. Empowered ED, is not rooted on giving up all control of a campus as a method to turn these around, he explained, but in giving teachers within campuses the ability to take control of their campus by building on their unique strengths and targeting their unique challenges. 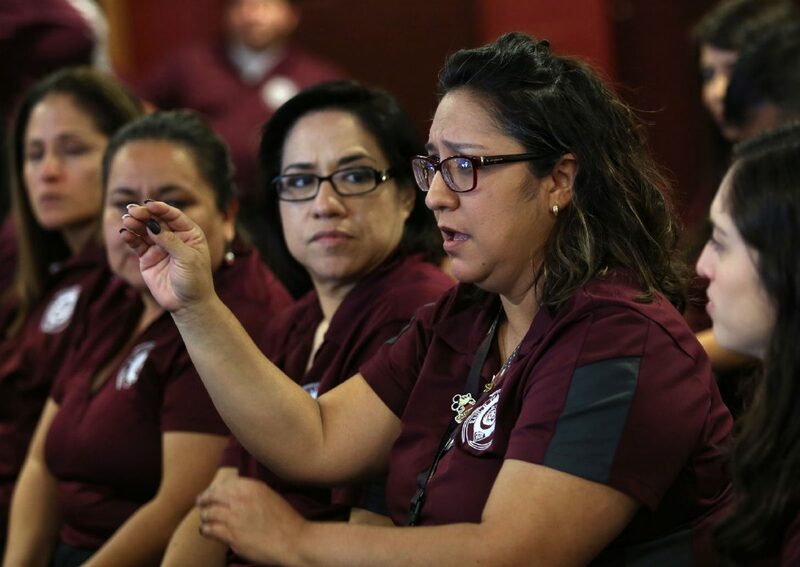 It could potentially eliminate the one-size-fits-all model which may not fully address the needs of all students in a large district, such as PSJA’s with 43 campuses. Additional funding would immediately affect staff, he said, as he proposed giving significant raises to teachers if and when the program kicks in, which is proposed for the 2018-19 school year. Additional staff would also be hired in order to lower the adult-to-student ratio, fund innovative programs in schools, increase maintenance and improvement investments and potentially lower tax rates in the area by becoming less reliant on these funds. The overall plan includes having the school district partner with five to seven eligible nonprofit groups, known as 501(c)(3), that would be created by local education experts with a successful track record in the field to aid a cluster of campuses in reaching their goals. King calls these partnerships Innovative Management Organizations, or IMOs, and they would be held accountable by performance-based contracts. Teacher contracts, including current benefits and protections, would remain as they are, he assured. This model, however, would shift the typical leadership structure, as now both the superintendent and these entities will answer directly to the board of trustees. While King’s main role would remain practically the same, he explained, these IMOs would work to fulfill their contract and be evaluated by not only him, but by a committee of teachers that are working inside those campuses. The measurement for teacher empowerment will be decided by and evaluated along the way by teacher and administrator committees, he said, along with the innovative models and goals for each campus. 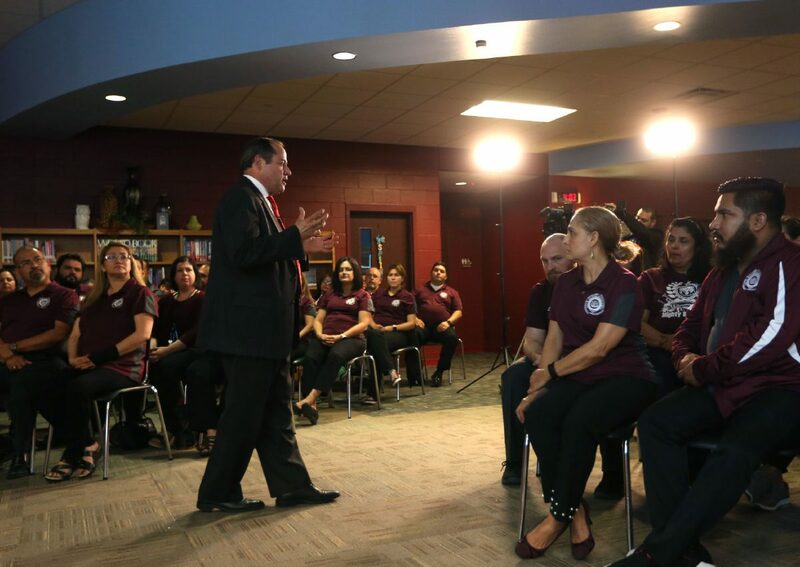 After sending a letter to teachers last week, King began presenting it to teachers in person on Thursday, when he met with all teachers at Yzaguirre Middle School to go over the plan and answer questions. This introductory meeting was broadcasted live to all other campuses as he urged all principals to gather their teachers at the same time, but the superintendent will continue visiting campuses in the next two week. Teachers are the first approval tier in the process and are expected to vote in a few weeks. The vote, King said, will be anonymous and they plan to have a process in which the ballots will be counted by their peers on-site to avoid discrepancies. And as teachers asked questions on Thursday, King made it clear that participating campuses will have a voice and responsibility to participate in the innovation of their school, and those that choose to opt-out should know that by law the money linked to this bill could not go to their district as this is tied to the partnerships.